When we visited Kosovo for Glory Issue 2, we saw how armed conflict can disrupt and displace the beautiful game. Once the first shot has been fired, football tends to fall by the wayside. People have more important things to worry about. Kosovo’s domestic game is yet to recover from the war that ripped the country apart between 1998 and 1999. Not so long ago, Kosovo’s best clubs fought toe-to-toe with the likes of Serbia’s mighty Red Star Belgrade – and occasionally came off the better. But during the war years, they were forced to compete on waste ground and even abandon matches completely under threat of violence from the Serbian military police. But armed conflict isn’t something consigned to Europe’s troubled past. The War in Donbass is currently affecting thousands of lives across Donetsk and Luhansk, and unsurprisingly, the region’s football teams have suffered too. Ukraine comes in at a lowly number eight in UEFA’s ranking of Member Associations, and yet, Shakhtar Donetsk remain comparative European heavyweights. Ukraine’s second-most successful club regularly unsettle the bigger fish in the Champions League, and have even tasted outright European success with a Europa League victory in 2008. But even former European champions aren’t immune to the shadow of war. 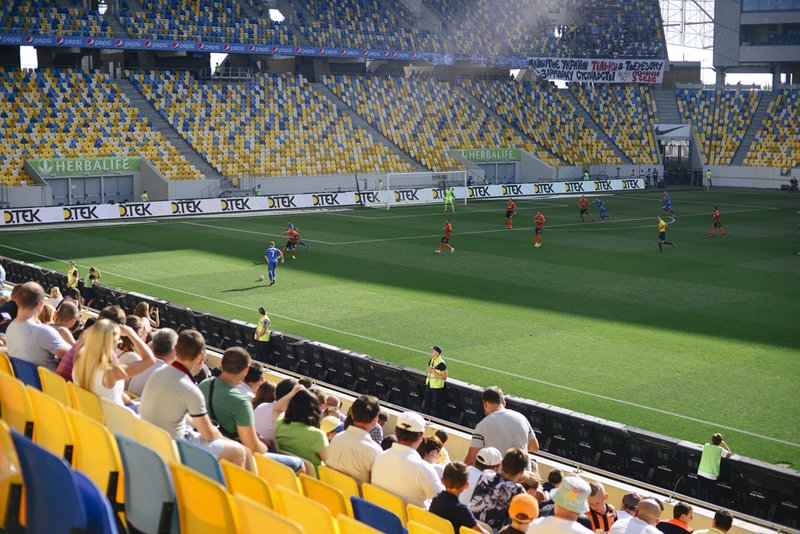 When photographer Andrew Zwarych attended Shakhtar’s home tie against Dnipro Dnipropetrovsk in August, it wasn’t in the home side’s Donbass Arena. Instead, the game took place 600 miles away, in Lviv. As of July 2014, Shakhtar have played all their home games there – both league and Champions League. It simply wasn’t safe to stay put. Since then, the Donbass Arena has twice been damaged by artillery shelling. And remember, this isn’t some far-flung football backwater – Shakhtar Donetsk is the club where Willian, Fernandinho, Henrikh Mkhitaryan and Douglas Costa earned their chops. The club could escape the conflict in Donbass, but many of their fans could not. As such, Zwarych’s images depict a match played in a near-empty stadium. The Arena Lviv is no home away from home for Shakhtar. As is the case for all big, successful clubs, there are many in Ukraine who want to see Shakhtar fail. This is particularly true in Lviv. Zwarych describes the city as “the most culturally Ukrainian of all the major Ukrainian cities”, and Shakhtar as a “pro-Russian team”. As such, there’s no shortage of animosity towards the visiting giants. Zwarych says that the majority of fans at Shakhtar’s so-called home games are either “rooting against Shakhtar” or “there to support the away team”. After winning five consecutive league championships, Shakhtar have been forced to settle for second-best in the past two seasons. Without their home advantage, Shakhtar cannot compete on level terms with Dynamo Kyiv. Even in football’s modern, cash-rich era, there are more powerful engines than the world’s favourite sport. If a European powerhouse like Shakhtar can be forced from their home, it can happen to anyone.